Hesford Marine is just what you need to complete any size boat project, big or small, Hesford Marine has been providing it's services since 1962. 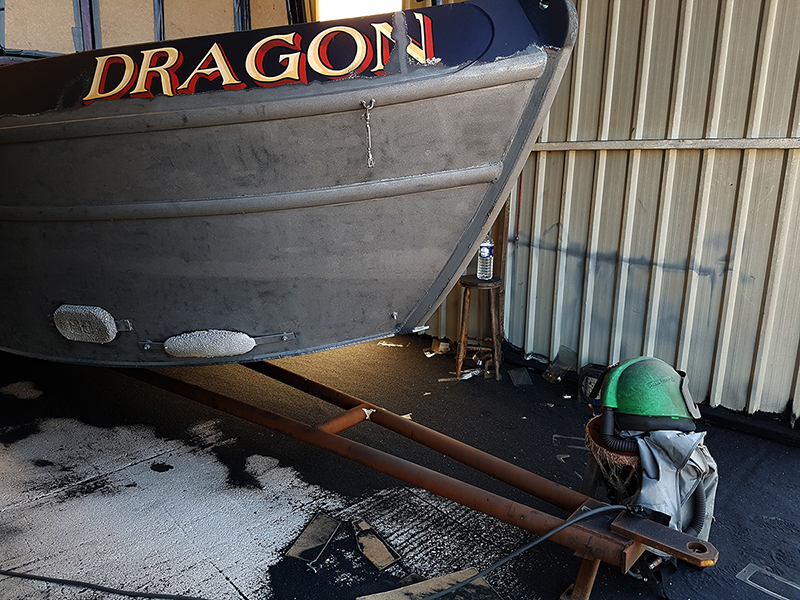 So, whether you plan to do it yourself or choose someone to do it for you, our boat yard is the place for you! When you need to get your boat out of the water (up to 20 tons), Hesford Marine is the place to do it. With space for 70 boats and 2 under cover boat sheds on 1.5 acres, we have the hauling capacity to safely lift your boat. Located by the Bridgewater Canal at Warrington Lane, Lymm, we are just minutes away from the M6 and M62 motorways. Looking for a place to work on your boat? Look no further. 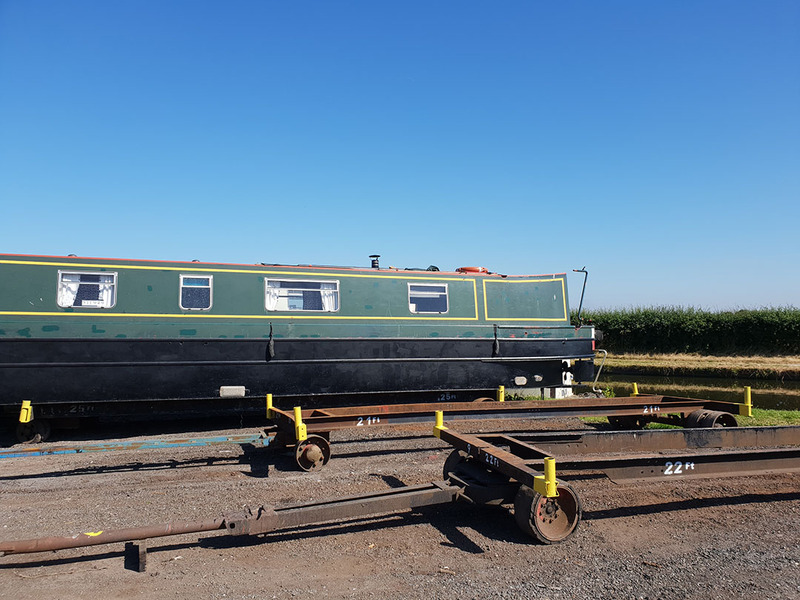 Hesford Marine offers hard standing for boats and narrowboats up to 70 ft. We also provide Moorings but these are fully allocated for the forseeable time. 240V Electrical Supply is also available for repair work or should you desire to stay aboard. 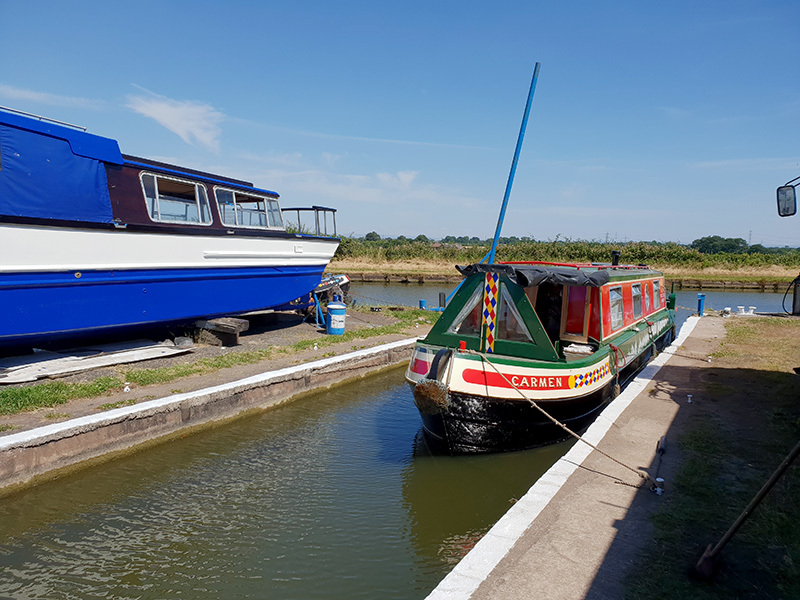 Hesford Marine can provide lifting facilities for bringing your boat out from the Bridgewater canal and for placing on either hard standing or to lorry for transport. We have an onsite 35 Tonne Mobile Crane and Tug enabling us to provide for the majority of boat lifting requirements. We are however unable to provide lifting facilities for V Bottom, Springer or Wide Beam boats. Hesford Marine provides a boat blacking service which includes two full coats to rubbing strake and one coat on the waterline. We use International Intertuf 16 Blacking. We would normally expect to retain the boat for approximately ten days to allow the Intertuf to harden and cure. This can vary depending on the weather conditions. If requested Primocon may be used at £4.50 per foot, inclusive of paint. Charges are £10 per foot (Intertuf) with an additional cost of £45 for pressure wash and rent chargeable at £0.65 per foot per week (minimum charge is for 25ft boat). Hesford Marine has an onsite chandlery which stocks all the accessories and items needed for narrowboating including diesel, kindling, safety products, rope, paint, clothing, hardware, windlasses and much more. 9.00 am to 4.00pm, Mon to Thu. 9.00 am to 3.00 pm Fri.
Hesford Marine provides the sale of Red Diesel and this is available at the fuel pump located alongside the Bridgewater Canal by the Hesford Marine Slipway. Red diesel (also known as gas oil, 35-second burning oil, tractor diesel, cherry) is the low-tax fuel used by Narrowboat users. It is illegal to use for on road vehicles. You will be required to provide a signed declaration of the intended use of any diesel purchased. Hesford Marine has a number of electricity outlets available across the boat yard for use by it's customers. Electricity tokens are available from the Hesford Shop. A Pressure Washer is available for use. 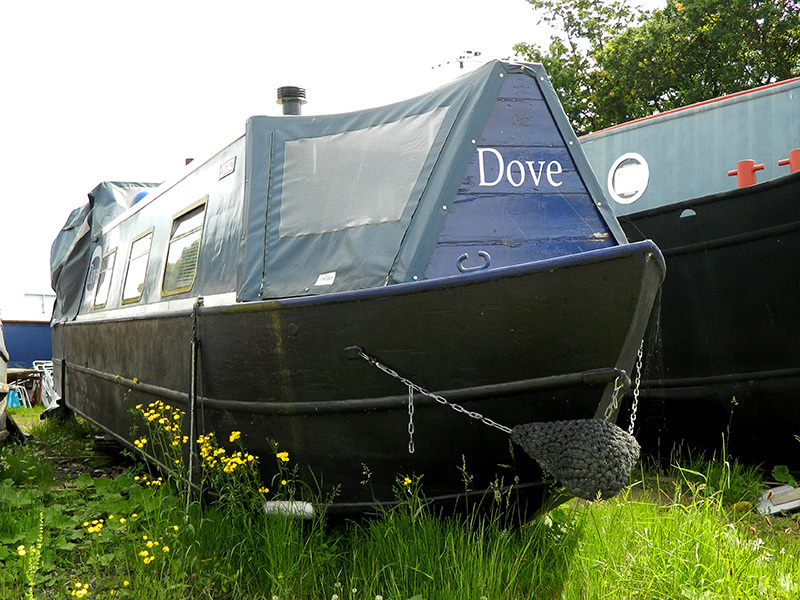 Two indoor boat sheds are available for use subject to availability. Treating your narrowboat to this service is the best thing it could possibly receive to its painted surface, this is because steel naturally wants to rust caused by the mill scale. Mill scale on new steel is dark in colour unless exposed to the damp then it rusts. When a boat is sand or grit blasted the grit penetrates the steel removing this mill scale, significantly increasing the life of any further paint on the hull or cab. £0.65 per ft (length) per week. Hesford Marine has a number of electricity outlets available across the boat yard for use by it's customers. Electricity tokens are available from the Hesford Shop. A Pressure Washer is available for use. Two indoor boat sheds are available for use subject to availability. 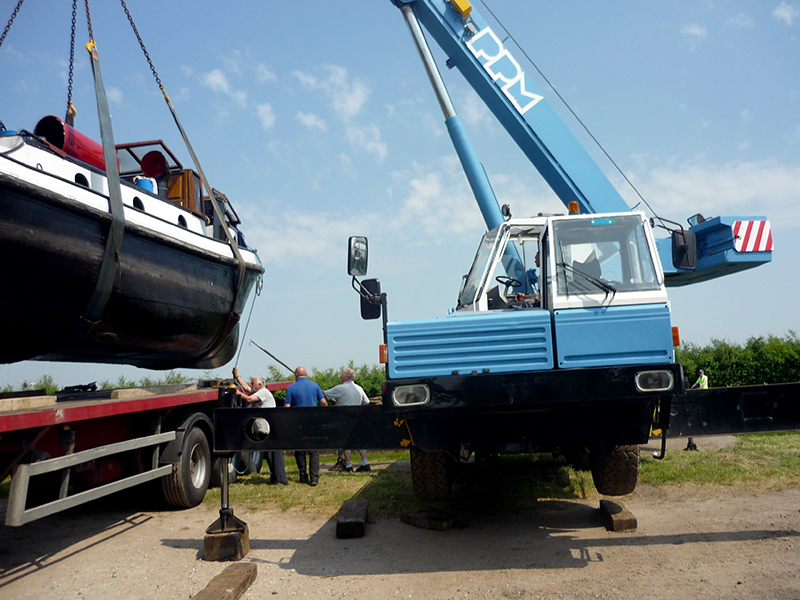 Hesford Marine can provide lifting facilities for bringing your boat out from the Bridgewater canal and for placing on either hard standing or to lorry for transport. We have an onsite 35 Tonne Mobile Crane and Tug enabling us to provide for the majority of boat lifting requirements. We are however unable to provide lifting facilities for V Bottom, Springers or Wide Beam boats. Hesford Marine provides a boat blacking service which includes two full coats to rubbing strake and one coat on the waterline. We use International Intertuf 16 Blacking. We would normally expect to retain the boat for approximately ten days to allow the Intertuf to harden and cure. This can vary depending on the weather conditions. If requested Primocon may be used at £4.50 per foot, inclusive of paint. Charges are £10 per foot (Intertuf) with an additional cost of £45 for pressure wash and rent chargeable at £0.65 per foot per week (minimum charge is for 25ft boat). 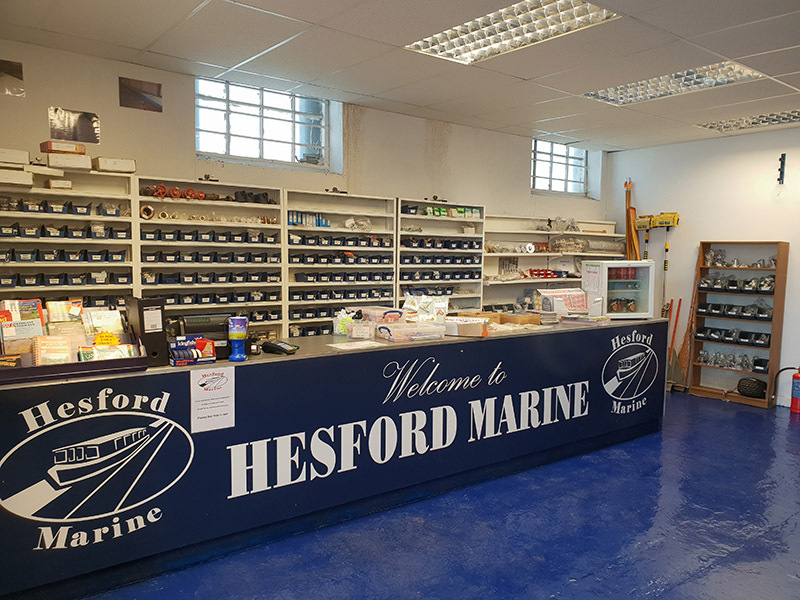 Hesford Marine has an onsite chandlery which stocks all the accessories and items needed for narrowboating including diesel, kindling, safety products, rope, paint, clothing, hardware, windlasses and much more. Opening times are, 9.00am to 4.00pm Monday to Thursday, 9.00am to 3.00pm Friday. We are closed at Weekends and Bank Holidays. 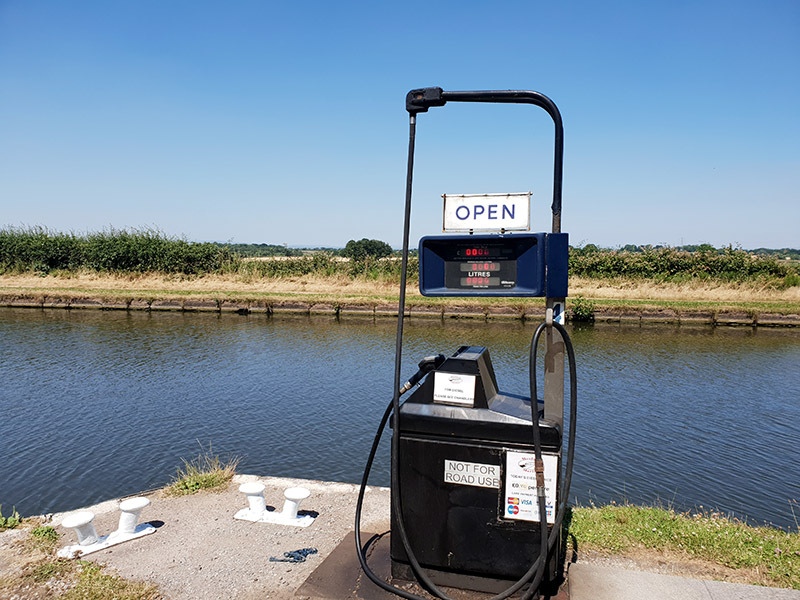 Hesford Marine provides the sale of Red Diesel and this is available at the fuel pump located alongside the Bridgewater Canal by the Hesford Marine Slipway. Please call for current price. Red diesel (also known as gas oil, 35-second burning oil, tractor diesel, cherry) is the low-tax fuel used by Narrowboat users. It is illegal to use for on road vehicles. You will be required to provide a signed declaration of the intended use of any diesel purchased. At Hesford Marine we offer highly competitive hard standing rates. Hard Standing is available for all sizes of boat up to a maximum of 70ft. Please call to check availablity. Hesford Marine has 2 Boat Sheds available and hard standing for long or short term storage of your boat, where work can be carried out either by yourself or by persons appointed by you.